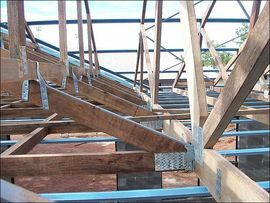 Trusses are typically made of wood, steel, or a combination of the two. They come in a variety of pitches and a vast quantity of styles. Prices vary greatly by size, material, and type. Generally speaking, trusses run from $3.90 to $4.40 per square foot of building area.